As another Memorial Day is upon us, I’m reminded of what my parents taught me about Memorial Day. It is a day for remembrance of those that have fallen in defense of this great Nation. My grandfather fought in WWII on an aircraft carrier and sadly, I never had the privilege of hearing any of his stories about his time in service. All I can do is try to learn as much as I can about the ship he was on and visit his gravestone to plant a flag, letting him know how much I miss him. I’m deeply saddened that my children never got to meet him, so Memorial Day has an even deeper level of meaning to us as a family. And since we no longer live in the Missouri area, we have learned to find other ways to observe Memorial Day and remember my grandfather. I make a point to share with them what I know of his military service and we focus on the holiday as a whole: the true meaning and history of Memorial Day, and not the sales, parties, and summer kick-off it’s become to many people. This is not a day to party, play on the lake, or even to thank a veteran. It is a day to remember those who have given the ultimate sacrifice. 1. Observe the traditional Decoration Day traditions. – Fly the Flag at half-staff from sunrise until noon and then raise to full for the remainder of the day. You can use this as an opportunity to teach your kids about properly flying and caring for the Flag. Additionally, the day was intended for the decoration of the graves of the Fallen with flowers, particularly red poppies. In past years, we’ve visited the small cemetery where my grandfather is buried and decorated his grave and planted flags at other veteran’s grave sites that no longer had family around to do so. For more on the history of Memorial Day/Decoration day, click here. And for more about the VFW’s Buddy Poppy, click here. 2. Visit a National or State Cemetery. – If you don’t have a particular veteran’s resting place to visit, consider visiting a nearby National or State Cemetery with your family. To find one near you, click here. 3. Observe the National Moment of Remembrance. – This was a resolution passed in 2000 which asks that at 3 p.m. local time, for all Americans “To voluntarily and informally observe in their own way a Moment of remembrance and respect, pausing from whatever they are doing for a moment of silence or listening to ‘Taps.” It’s a small but powerful way to observe the importance and intent of the day. 4. Have a history lesson. – There are our favorite ways to keep the kids interested and involved in our patriotism. 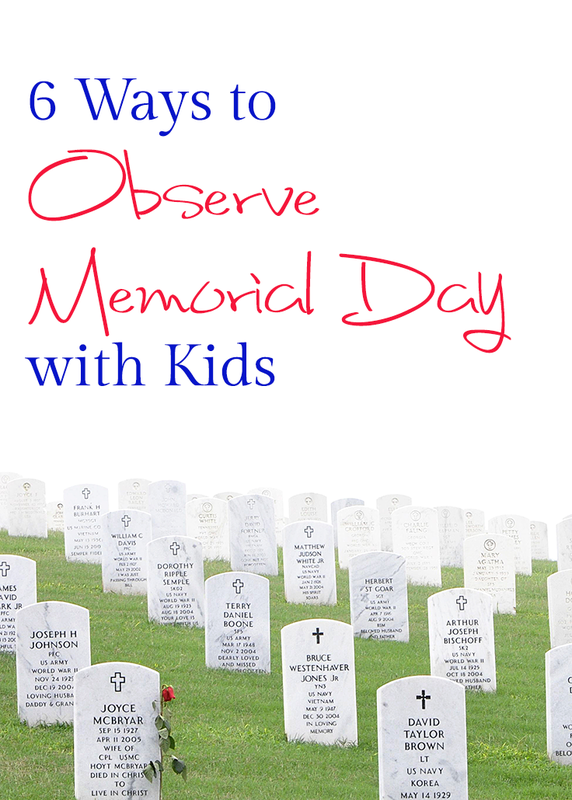 While we do these things throughout the year away, we make a point to plan something special for Memorial Day. We currently live in an area rich with military history ranging from General Custer to the War of 1812. There are museums and historic battlefields, and plenty of opportunities to explore local history in relation to Memorial Day. Attend a Reenactment. – After all, Decoration Day was established after the Civil War, and those reenactments can be a great way for kids to discover in a more tangible way the sacrifice we are taking special time to honor. If you’re in Michigan, you can find a thorough listing here. If not, a quick web search (or visit to your local history museum) can help you find a list of events near you. Visit a Museum or War Memorial. – Again, one of our favorites things to do throughout the year, but if we’re visiting one over the holiday, we’re sure to pick one war-related. Favorites in the past have been the National Naval Aviation Museum in Pensacola, FL (it has an amazing section dedicated to the Vietnam War, and we greatly enjoyed learning more about the ship my grandfather served on in WWII) and the Perry’s Victory & International Peace Monument and Museum in Put in Bay, OH (officers from both sides were buried here after the War of 1812). Often overlooked, but one you don’t want to skip is the National World War I Museum at Liberty Memorial in Kansas City. Watch a Movie. – If your kids are older, consider watching Glory, Saving Private Ryan, The Patriot, Yankee Doodle Dandy, Forest Gump, To Hell and Back, Flags of our Fathers, or Band of Brothers. Read a Book. – For younger kids, try reading The Wall, America the Beautiful, A is for America, We the Kids, The Flag Maker, How to Bake an American Pie, F is for Flag and L is for Liberty. For older kids: Johnny Tremain and The Red Badge of Courage are excellent reads. 6. Volunteer. – Don’t forget that you can do this one all year round. There are some great opportunities to volunteer at the National and State Cemeteries (find more info on how here), check with local veteran’s memorials, or look for foundations helping the families left behind by Fallen Heroes of our generation. And on that note, remember to teach your kids the difference between Memorial Day and Veteran’s Day (Nov 11th). Memorial Day is for remembering and honoring the Fallen. Veteran’s Day is for thanking and honoring the living who are currently or have previously served. As a veteran, it’s appreciated that they are observed appropriately. So save the Thank a Veteran activities for November! Share your family’s remembrance outings and activities!